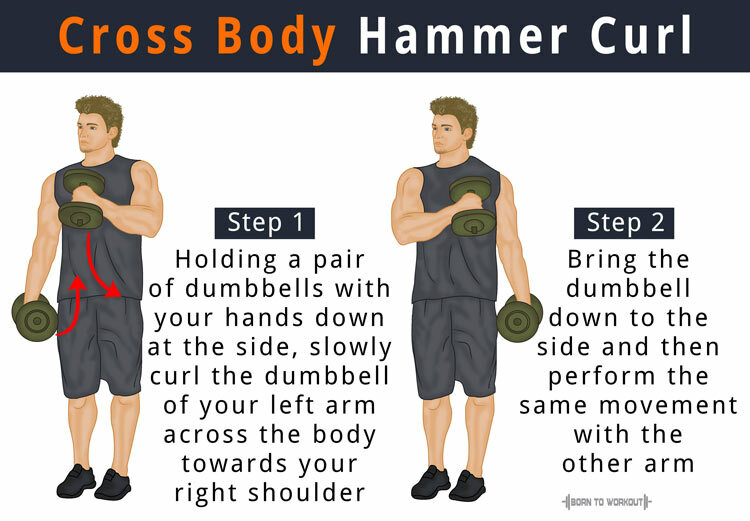 The cross body hammer curl specifically targets the brachialis of your forearms, which helps in “pushing” your biceps and triceps apart thereby assisting in building thicker arms. It is a shoulder flexion workout that reduces activation of your biceps muscle and therefore, can be used as a warm-up exercise. It creates a balance between the lower and upper parts of your arms. Stand up holding a pair of dumbbells with your hands down at the side and your palms facing your body (a neutral grip). It is the starting position. Slowly curl the dumbbell of your left arm across the body towards your right shoulder. Touch the upper part of the dumbbell to the shoulder and maintain the contracted position for a second. Gradually bring the dumbbell down to the initial position and then perform the same movement with the other arm. Continue doing the exercise until the required number of reps is done for each arm. While curling the dumbbell towards the shoulder, maintain the neutral grip position of your hand and make sure you do not twist your arm. Control the movement and do not let momentum to contribute throughout the exercise. Squeeze your biceps at the top of the movement to keep the muscles tensed.